Dental care is an often overlooked, but important component, of your dog and cat’s health care. A good sound dental program will provide comfort and longevity to your pet’s life as well as make them more pleasant to be around. Both dogs and cats both need routine dental care. We offer advice on home dental care and give you options on how to achieve the best results. Ask us how we can assist you in providing dental care for your pet. 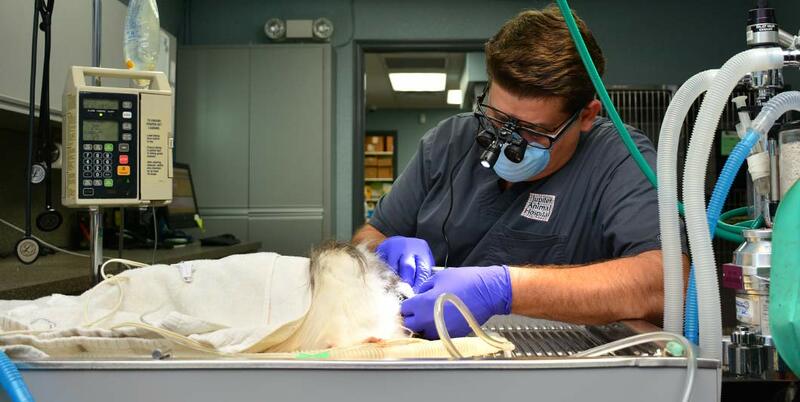 We also offer non-anesthetic dentistry for your dog or cat, a safe alternative to standard anesthetic dental cleanings for older pets and pets with chronic kidney, liver or heart disease who might not be a candidate for general anesthesia. Our techniques allow us to clean, scale, polish and flush above and below your pet’s gum line. Our process is that we build trust and approach your pet very slowly. As we build trust, almost every dog and cat we treat will allow us to use all of the same dental tools used in traditional veterinary dentistry. However, there are some pets who are not candidates for non-anesthetic dentistry, including pets with severe gingivitis, caries, fractured or loose teeth or stomatitis. In these cases, traditional dental methods are the best treatment options. Brushing your pet’s teeth every day will reduce or eliminate plaque buildup. Plaque, which is an accumulation of bacteria, will progress to periodontitis, which is characterized by pockets of chronic infection, oral pain, and severe infections. Left untreated, it will eventually loosen and destroy the tooth and possibly lead to bone loss. The infection under the gum line can also spread to the liver, kidneys and heart.